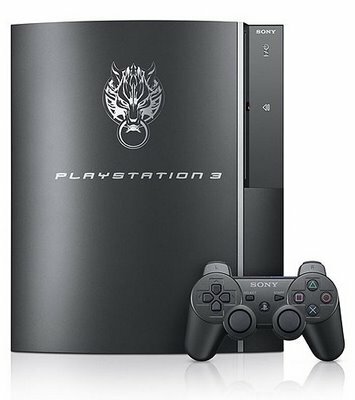 Once again we are graced with yet another special version of the Playstation 3. For Final Fantasy VII fans (like myself) , this PS3 might make you want to finally get one after all this time. Painted in "Cloud Black", this FFVII PS3 features the wolf emblem from Cloud's Advent Children outfit but it also comes with other goodies like the new re-release of the Advent Children that includes 30 more minutes of our favorite characters, a 160GB drive and even the demo to Final Fantasy XIII. Comes out next month in Japan, but like usual, us American gamers + otaku seem to be getting shafted since there is no set US release date ~_~ Well, here's some food for though Sony and Square-Enix...after doing my taxes I found I actually did over $100K in 2008 in anime and game sales for this site so...um Sony, Square-Enix, there is a market here for this...no need to shaft the US gamers because of needless fear of... "THE DREADED ECONOMY"
Granted, would any of you pay $550 for this set?